The following contains maps and descriptions covering most of the Killer Hill trails and is intended as references for future Killer Hill hares. Only the true trail is marked on the various maps. False trails, check backs etc are not shown. Maximum temperatures during Killer Hill weekends have varied between 9.8°C and 28.9°C averaging at 16.2°C. The temperatures have all been recorded at sea level. On average temperatures drop approximately 1°C per 100 metres of elevation. 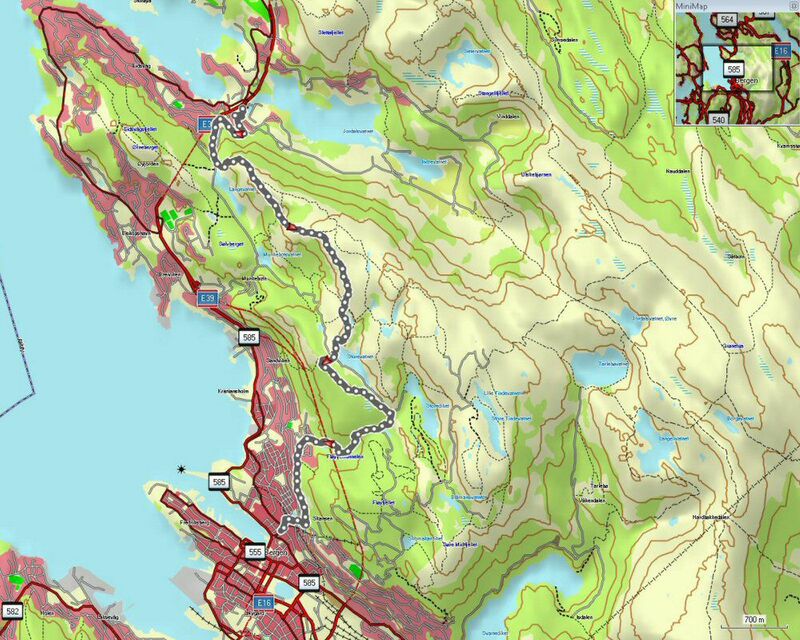 This was an A to B run with the ON-OFF from Sølvberget, not far from in Øyjorden. 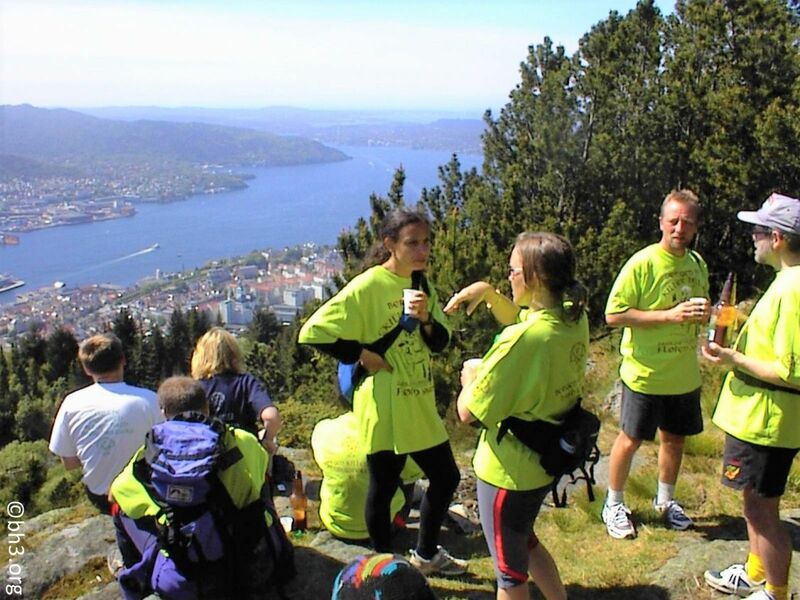 The first part of the trail followed a steep path up to a road that until 1930 was the main road between Bergen and Åsane, before heading straight up another steep path and ON-ON in the direction of Kvitebjørnen for a refreshment stop at Ankerhytten. From there the trail descended down to the road again and ON-ON to Storevannet and meandered along roads before hitting the final ascent to Fløyfjellet for lunch and a refreshment stop. After the obligatory group photo, ON-OUT was called and the pack split into groups following different routes down the mountain. Only the group running past Skansen found the ON-INN. All others followed imaginary trails to Vetrlidsalmenningen and the bus via different parts of Sandviken. This was an A to B run with the ON-OFF in Lono on the road between Midtun and Indre Arna. 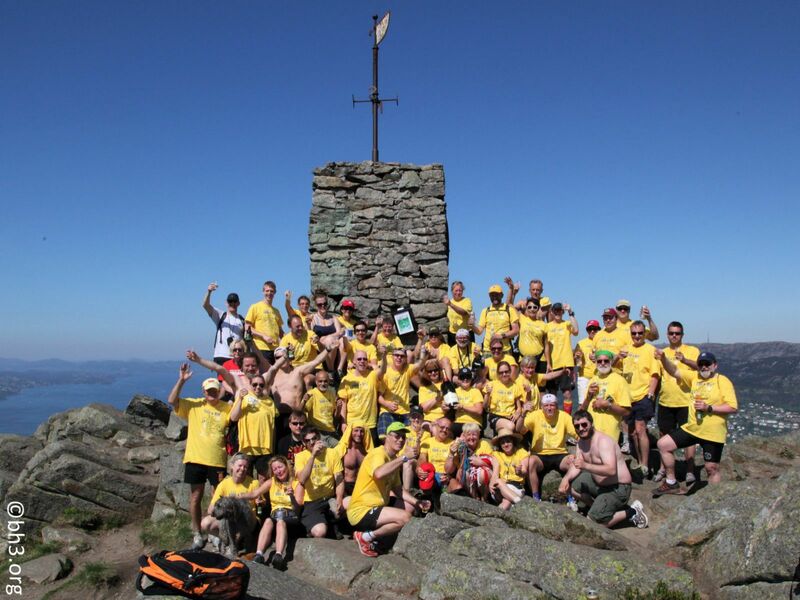 From there the trail first followed a dirt road before meandering ON-UP the in parts step path in the direction of Hauggjelsvarden, the highest point of the trail at 674.4 m.a.s.l., where the pack enjoyed the first relaxing drink-stop. 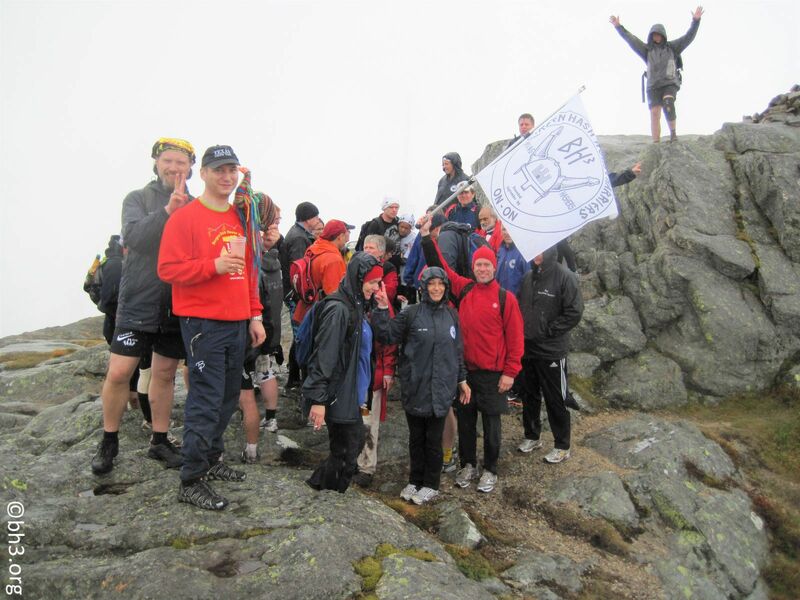 From there, the trail continued in the direction of the main path across Vidden and ON-ON to the summit on Ulriken. After a relaxing drink and nosh stop, the trail took us to the upper cable car station, but because there were a lot of tourists and locals using the cable car, there was an estimated 2-hour wait to get down. 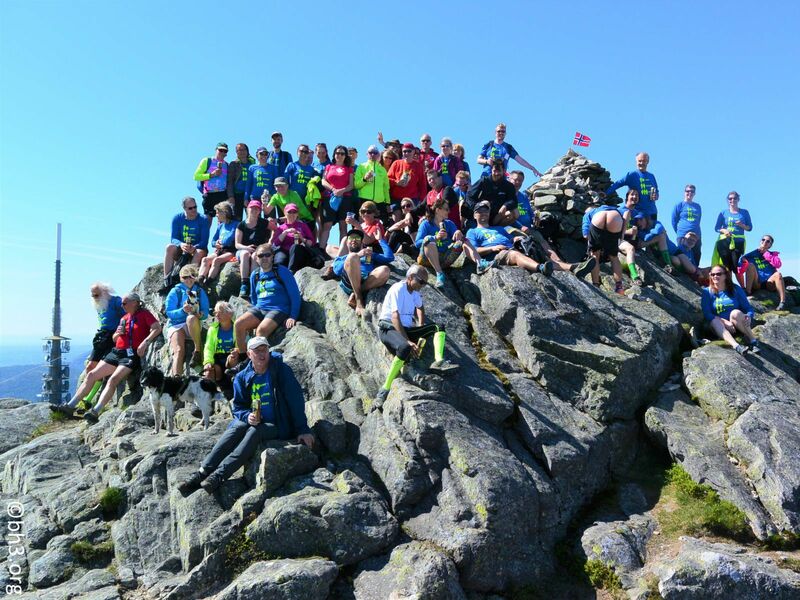 All except three hashers opted for the rather step descent down Lægdebotn and ON-INN to the bus waiting for the pack at the lower cable car station. 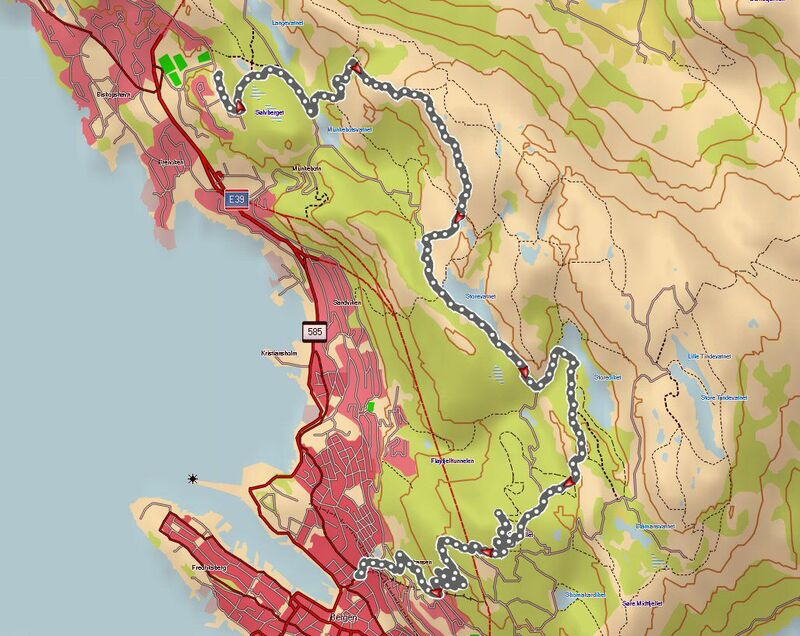 This was an A to B run with the ON-OFF at the same bus stop in Eidsvåg as for the 2014 Killer Hill. 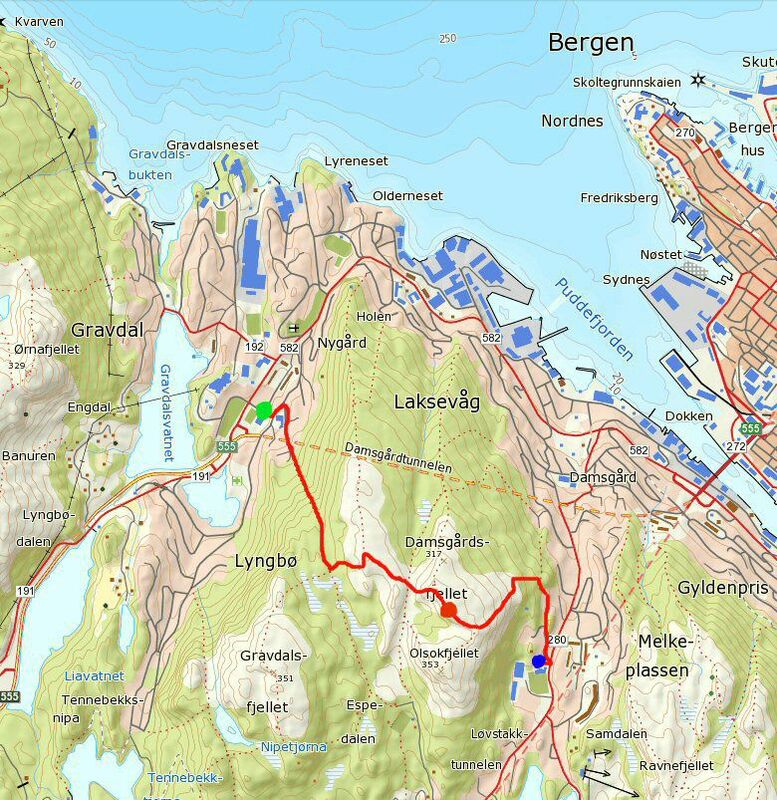 The trail followed the old postal road from Eidsvåg up to Langevannet. From there the trail followed the in parts very step path in the direction of Kvitebjørnen with a lunch stop at Ankerhytten. From there the trail descended down to Storevannet at the top of Stoltzekleiven and after a short walk on partly hidden paths ON-ON to the summit on Sandviksfjellet. After a relaxing drink stop, the trail took us down to Nedrediket before descending down Skredderdalen and along Fjellveien before descending down to the ON-INN in Vetrlidsalmenningen. This was an A to B run with the ON-OFF at Laksevåg Idrettshall. The trail followed a steep path through woods in the direction of the summit. 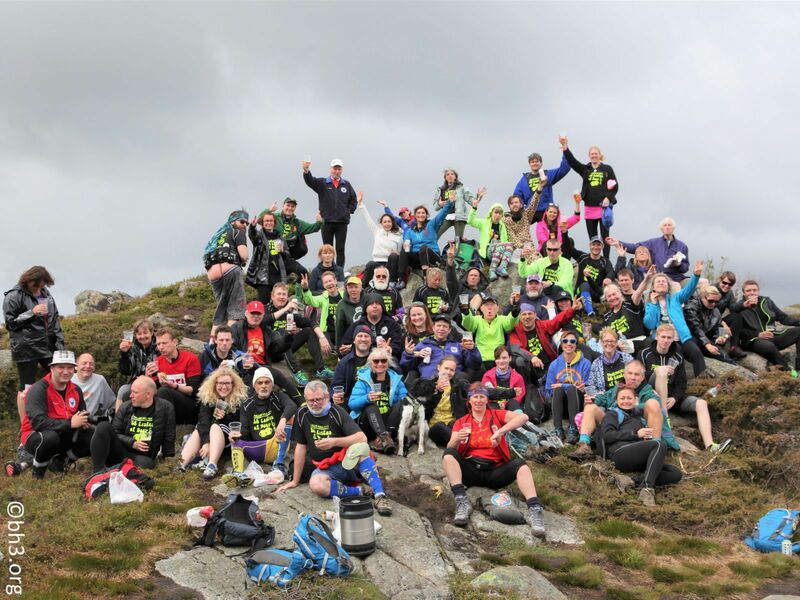 At a flat spot, a drink-stop was eagerly accepted by the pack before more up then down and finally a steep climb in the direction of the summit. 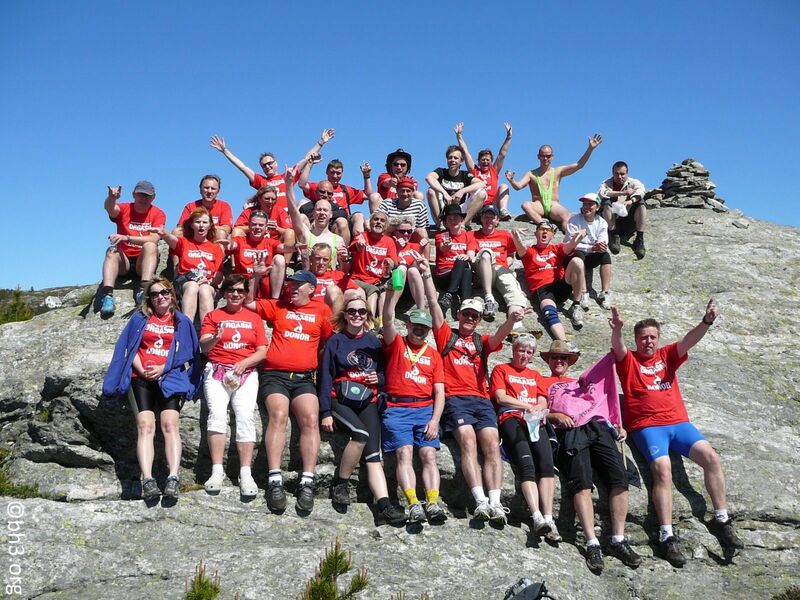 The summit at 317 metres above sea level was bypassed and the drink and nosh stop was at approx. 350 metres above sea level. The drink stop was served from a keg that a local hasher had carried up on the run! 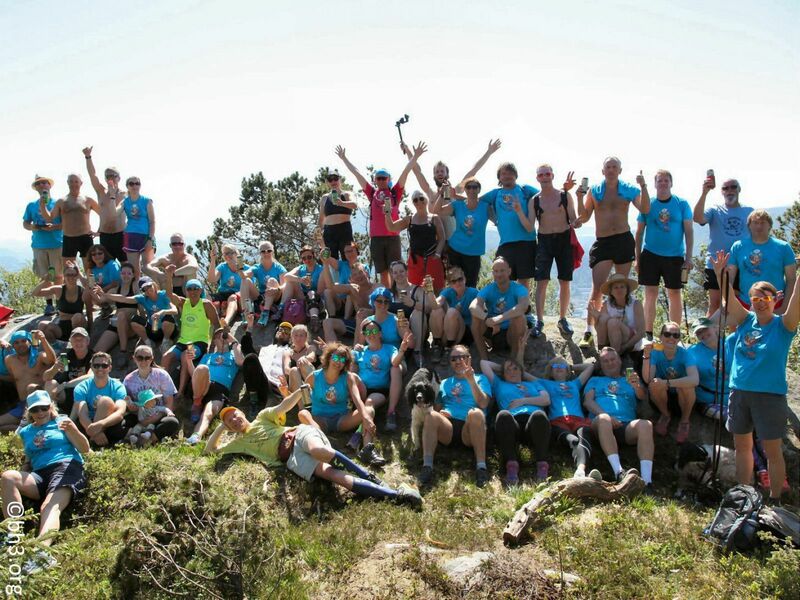 After some entertainment, the pack followed the trail down a steep climb to Melkeplassen and the ON-INN, with a mobile drink stop halfway down the mountain. This was an A to B run with the ON-OFF at the bus stop in Eidsvåg. 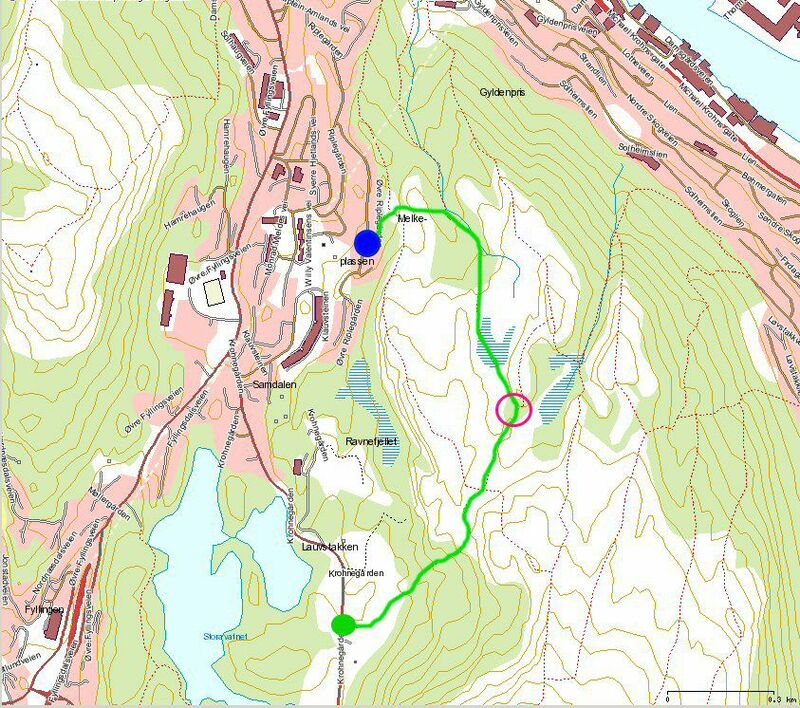 The trail followed the road into Jordal and up Jordalsskaret. 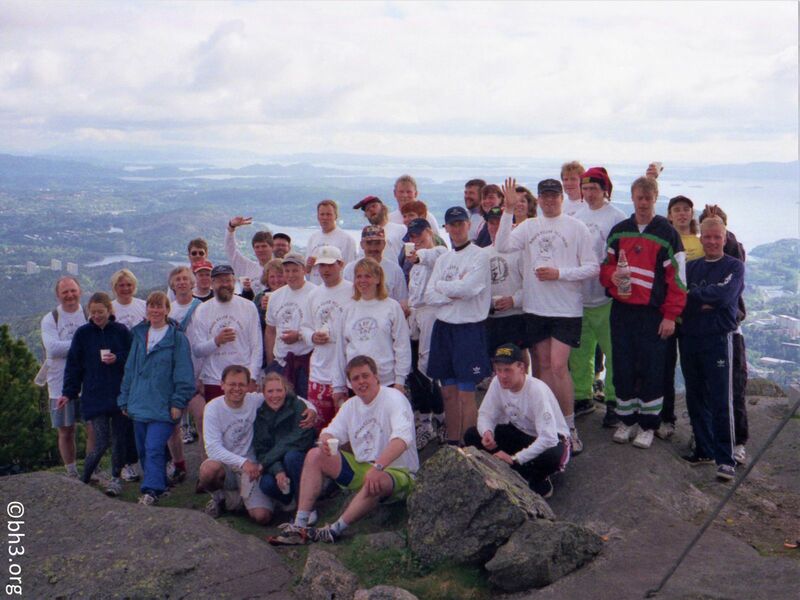 At the top of Jordalsskaret the trail joined the main path across Vidden and ON-ON to the summit on Rundemanen. 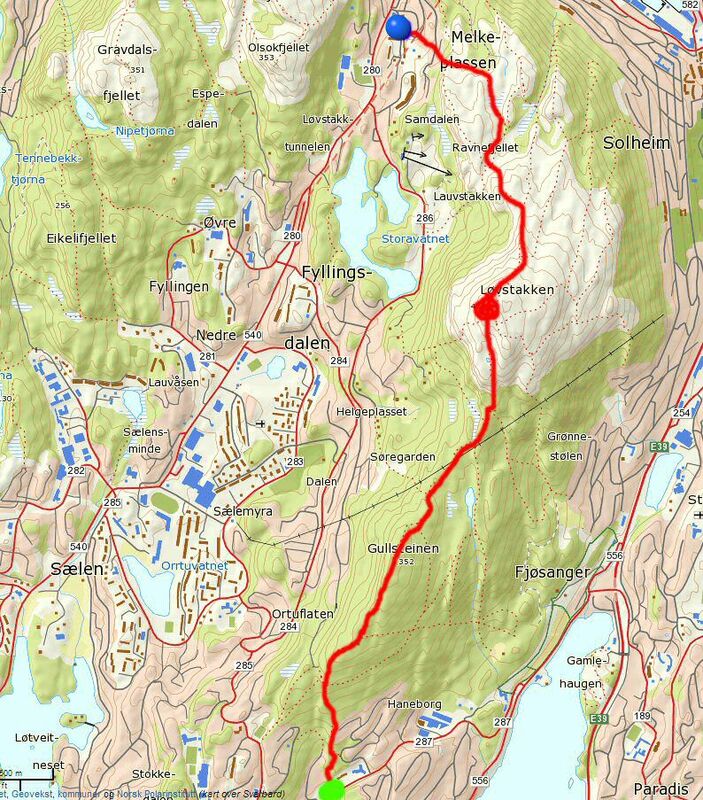 After a lunch and beer stop on the summit, the trail wound its way past Rundemansdiket and Storediket before it descended down Skredderdalen. From there it followed the roads down to the ON-INN at the pub 'Dr. Wiesener'. This was an A to B run with the ON-OFF in Kjøkkelvik. The trail followed the main path all the way to the summit with a game stop about halfway to the summit. 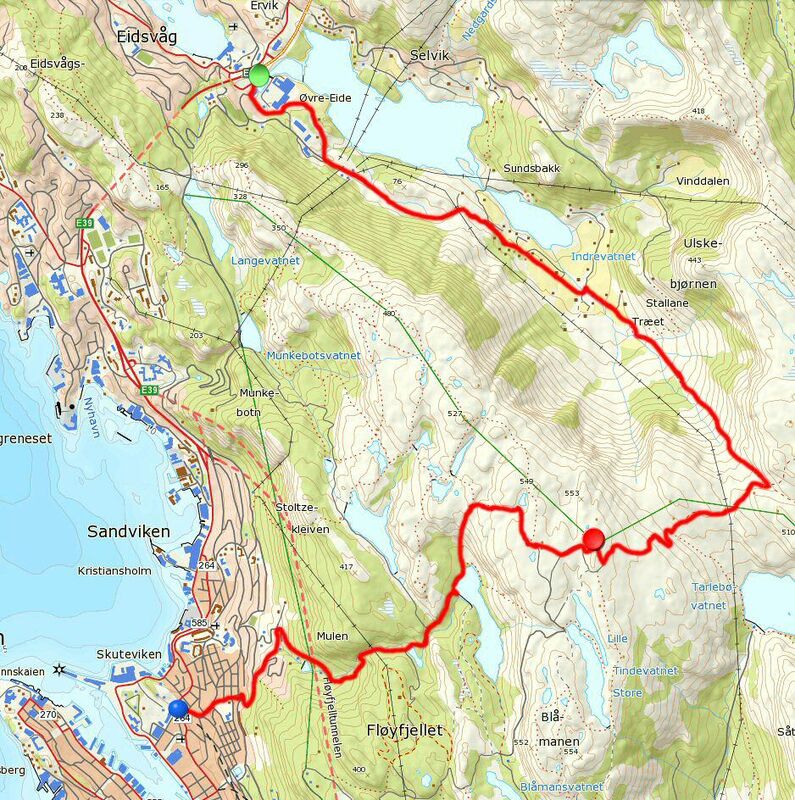 The trail followed the path down Banuren to Gravdalsvannet and along roads to the ON-INN at Gravdal. This was an A to B run with the ON-OFF at Øvre Kråkenes. 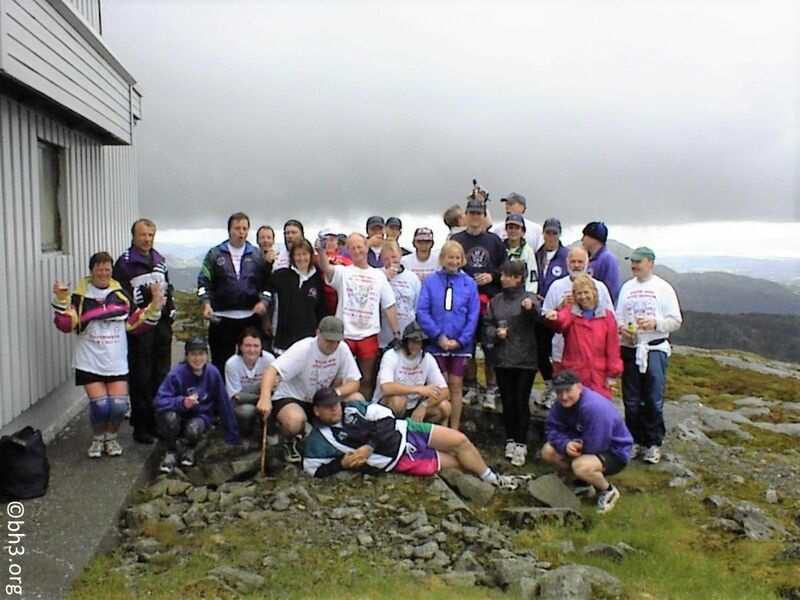 The trail followed the path up Gullstølen and on to the games stop on Gullsteinen. 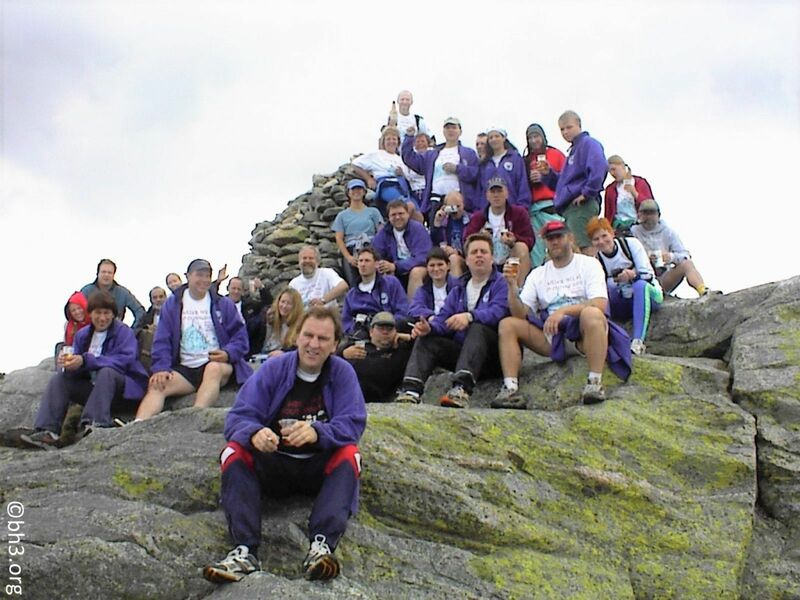 After the game stop the pack headed for the summit on Løvstakken. After the drink stop the trail zigzagged down paths through Skitnedalen followed by Nilsadalen and to the ON-INN in the area around Melkeplassen. 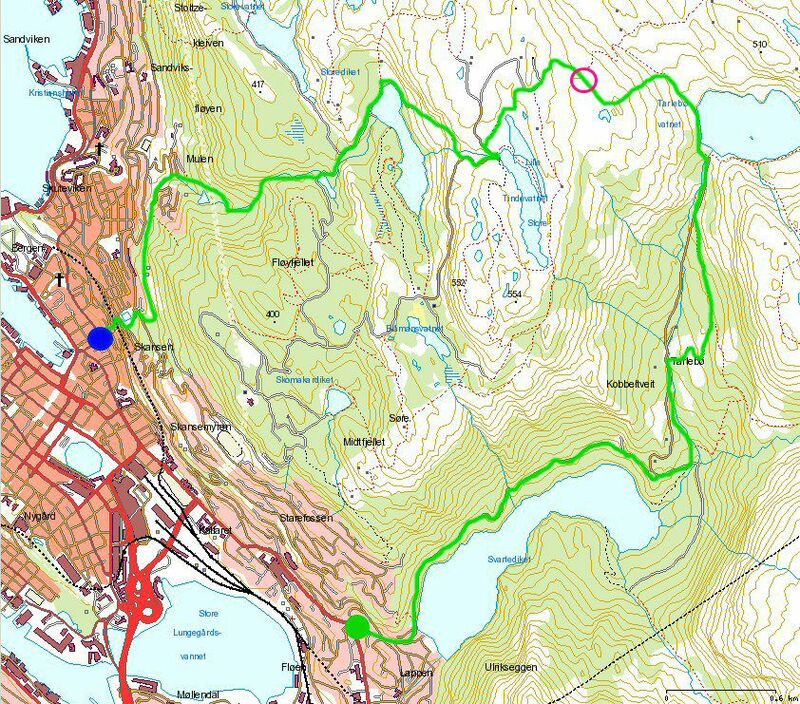 This was an A to B run with the ON-OFF just below Svartediket dam, part of the water supply in Bergen. 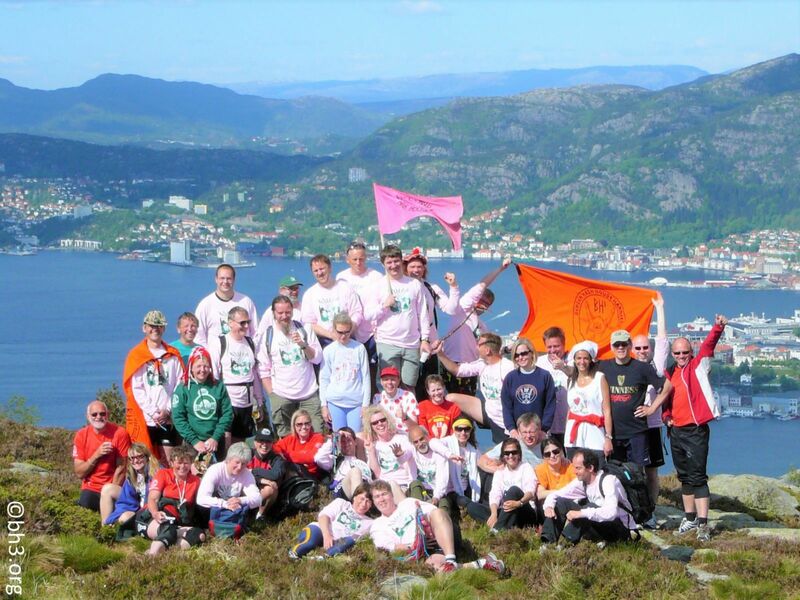 The trail followed the path up Knatten and from there to the games stop by Skomakerdiket. After the game stop the pack headed toward the restaurant on Fløyen and then on to Fløydalen and on to the summit on Fløyfjellet. 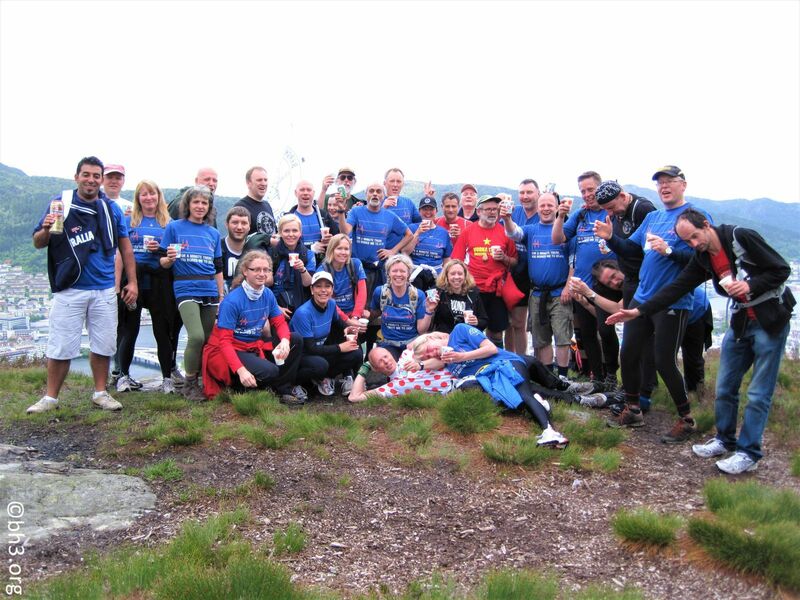 After the drink stop the trail zigzagged down paths past Vindeggen and to the ON-INN at Bryggen. 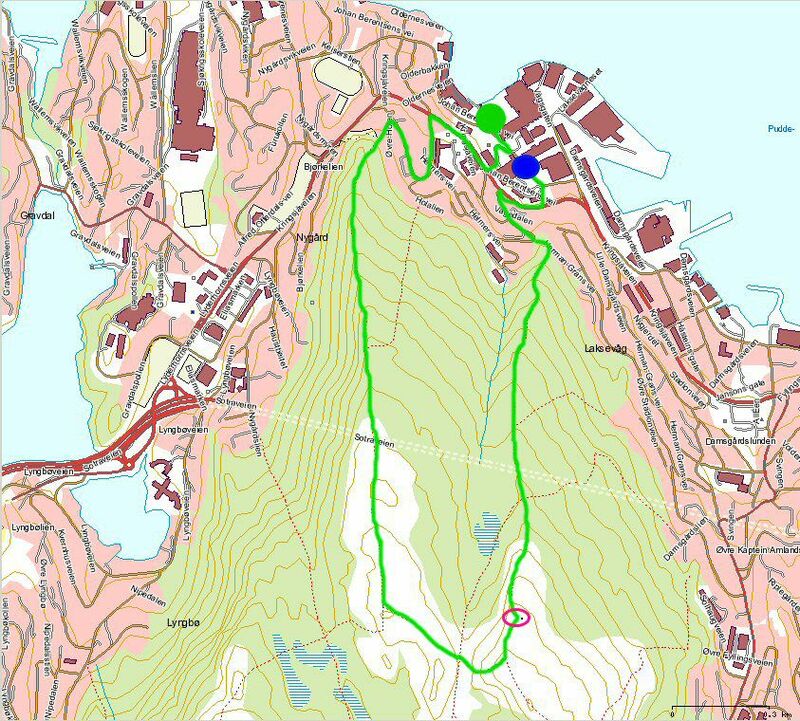 This was an A to B run with the ON-OFF just below Svartediket dam, part of the water supply in Bergen. The trail followed the road leading around Svartediket Lake to a game stop. From there the trail followed the path up Isdalen (Ice Valley) to the 1st drink stop, before it continued up Trolldalen (Troll Valley) and joined the main path which crosses Vidden. 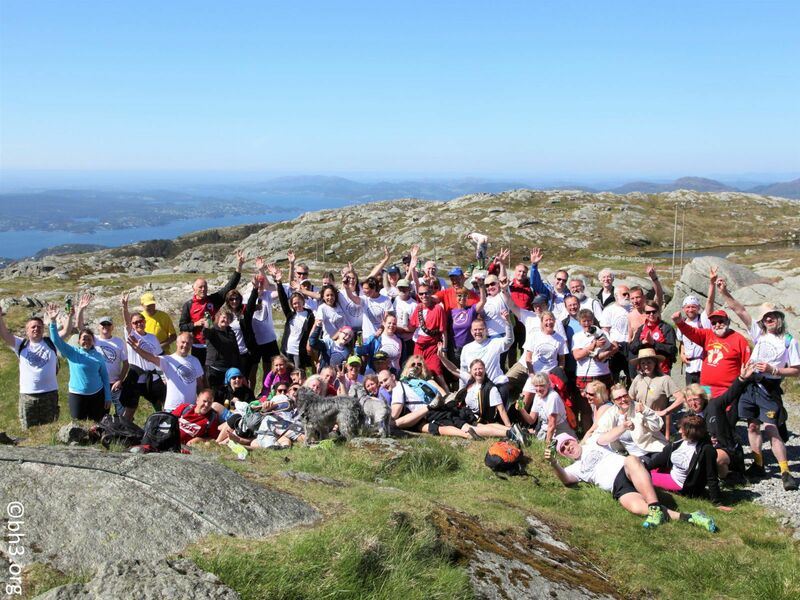 The trail followed the main path for a while before it headed for the summit on Ulriken and a combined drink and nosh stop. Most of the pack took the cable car down the mountain whilst the remainder of the pack followed the main path down the mountain. The pack reunited at the 3rd drink stop at Montana before reaching the ON-INN at the lower cable car station. This was an A to B run with the ON-OFF at Måseskjæret. 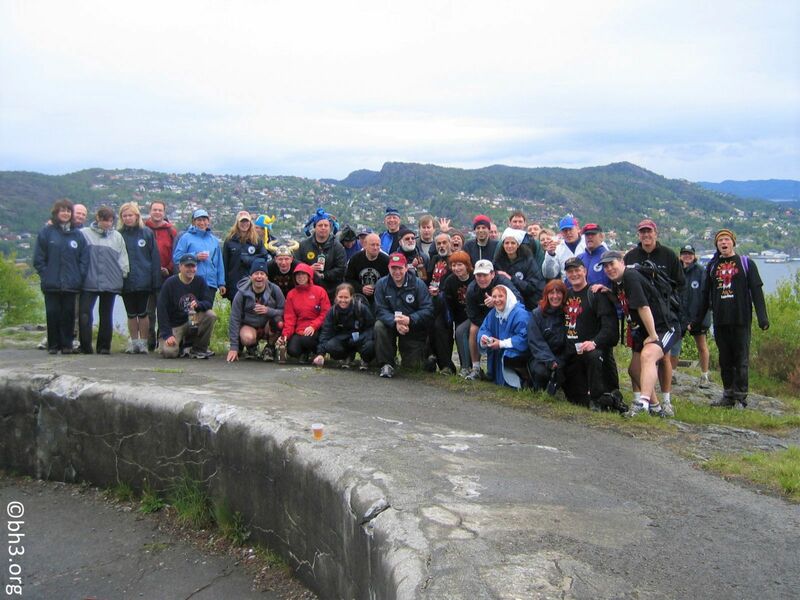 The trail followed the road up to the abandoned coastal fortress Sandviksbatteriet for a combined drink and game-stop. From there the trail followed a step path up to the ridge leading to Sandvikspilen at the highest point of Stoltzekleiven and from there on to the summit of Sandviksfjellet. The trail back down followed the path down Skredderdalen, where most of the pack followed the FRB's and missed the last drink stop. From there the trail followed Fjellveien to the ON-INN in Vetrlidsalmenningen. 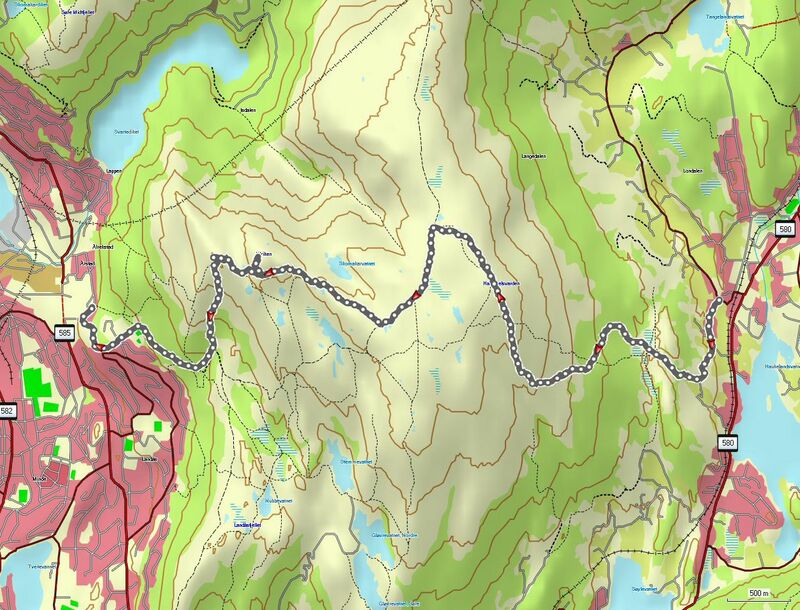 This was an A to B run with the ON-OFF at Tennebekktjernet. The trail followed the road and paths leading to Viggohytten. From there the trail lead to the summit on Gravdalsfjellet followed by the summit on Olsokfjellet and finally on to the summit on Damsgårdsfjellet. The trail back to town followed the trail to Damsgård and to the ON-INN in Kirkebukten. 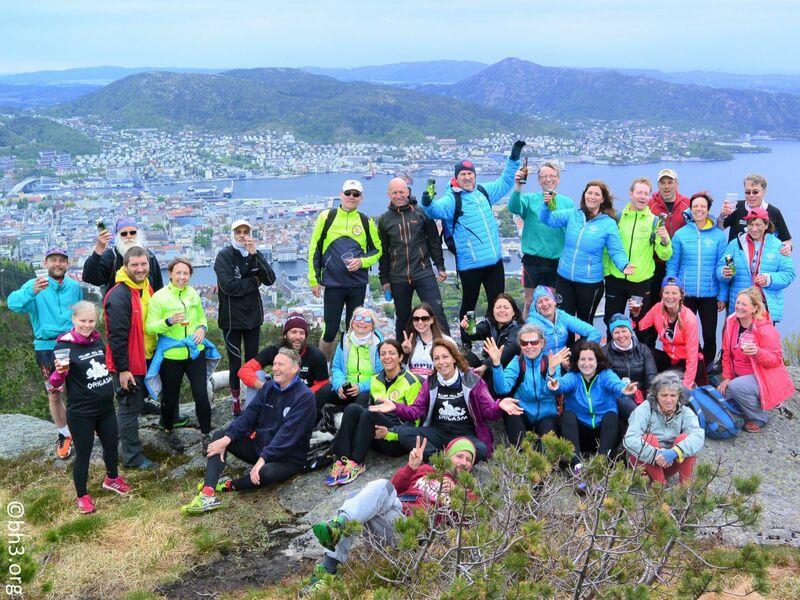 This was an A to B run with the ON-OFF below Svartediket dam, part of Bergen water supply. The trail followed the road leading along Svartediket and up Tarlebø valley past remains of some old farmsteads up to the Tarlebø dam. From there the trail followed the main path with a detour past Bergensbakken, a ski jump constructed of stone in the 1930's and only in use for a few years, and on to the highest point of the trail. From there the trail followed the road to Store Tindevann. At this point most of the pack followed the FRBs and ran down the road leading to the city centre. 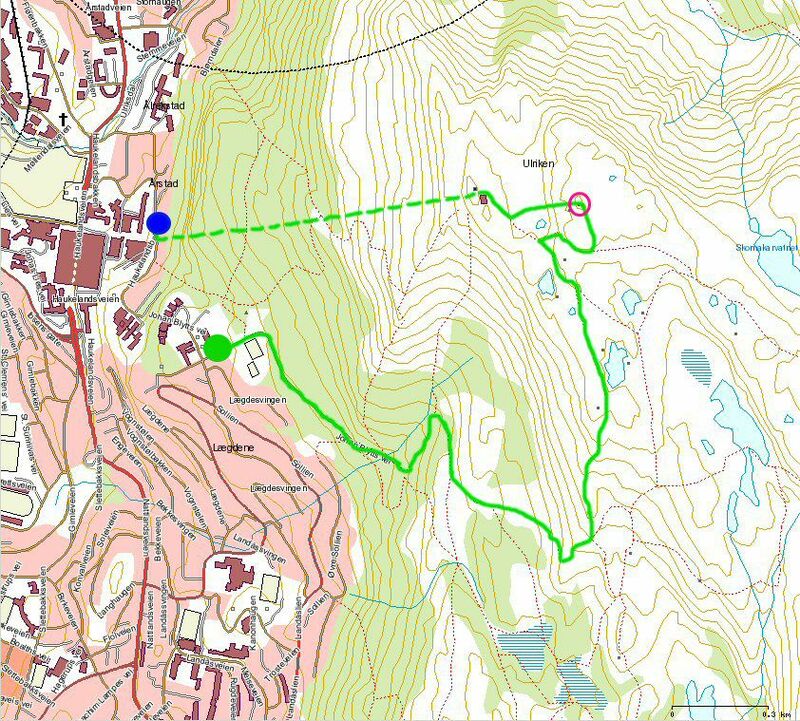 The trail, however, followed a path down to Storediket and Skredderdalen and along Fjellveien to the ON-INN at Skansen. The summit was not reached but the highest point of the trail was only a short distance from the summit. 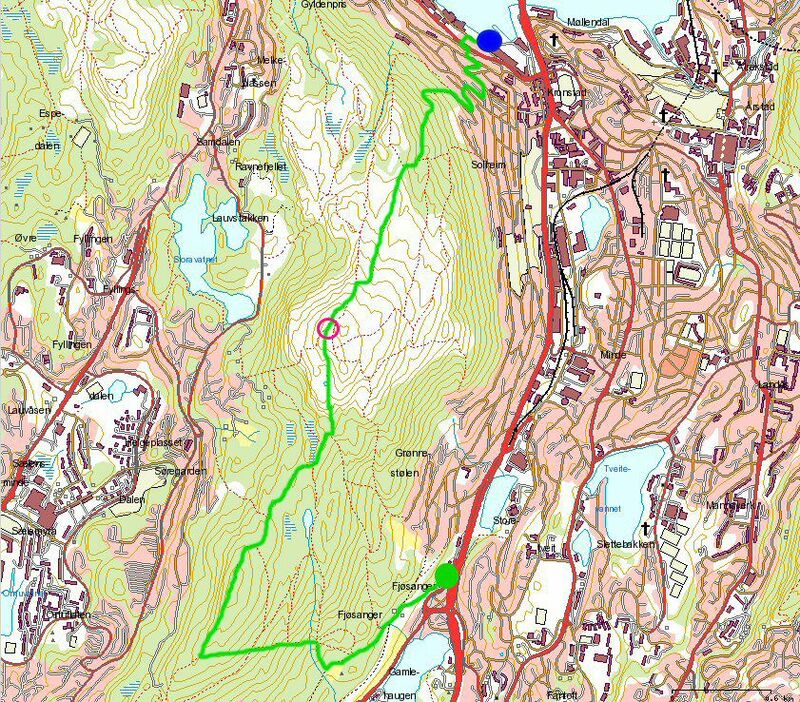 This was an A to B run with the ON-OFF at Olderdalen not far from Loddefjord. 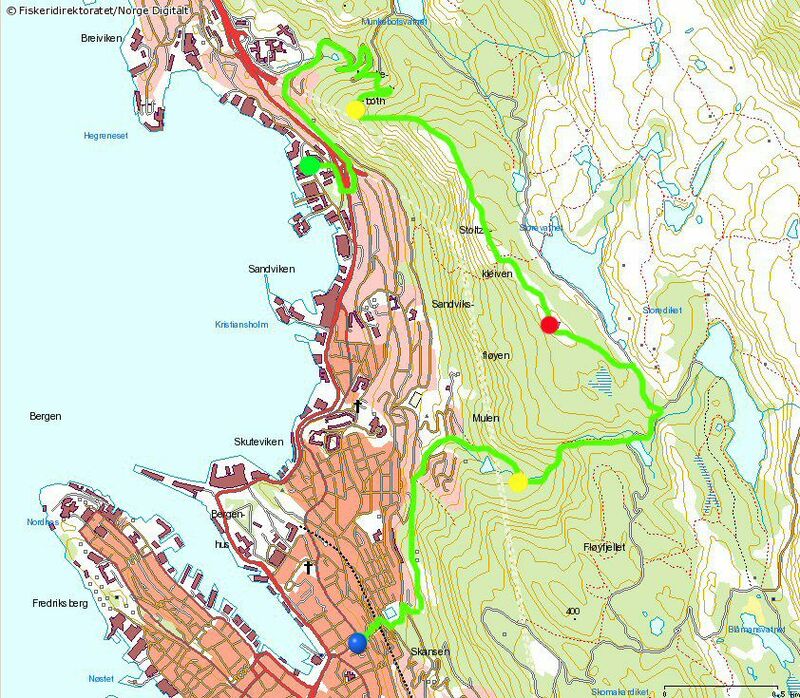 The trail followed the same paths as in 1999 but in the opposite direction with a very steep climb to the summit and an easier descent to NUTEC via the old coastal fortress at Kvarven. 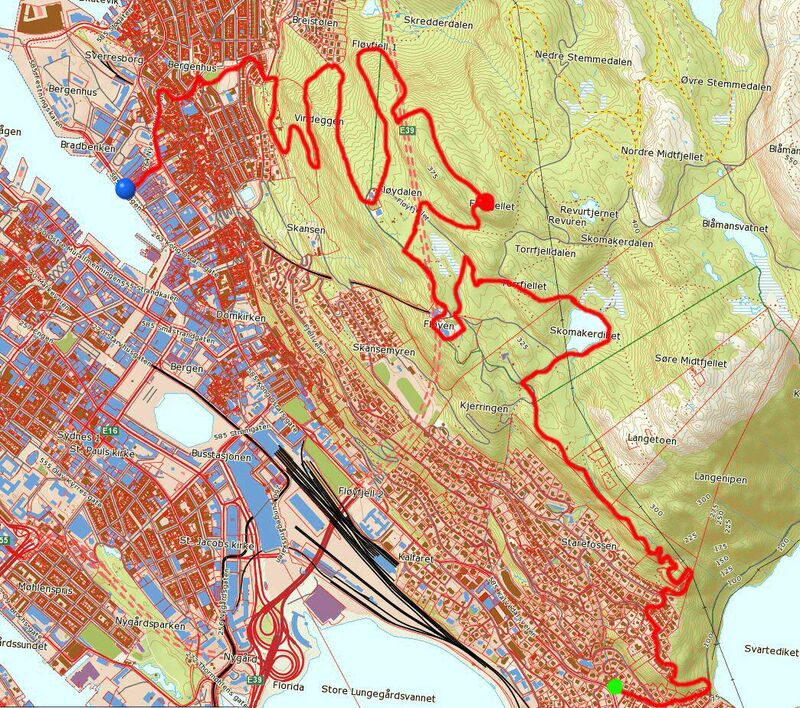 This was an A to B run with the ON-OFF at Fjøsanger. The trail followed the paths up and over Gullsteinen before heading for the summit on Løvstakken. The trail back down followed the path to Skillingsbollen and to the ON-INN in Solheimsviken. 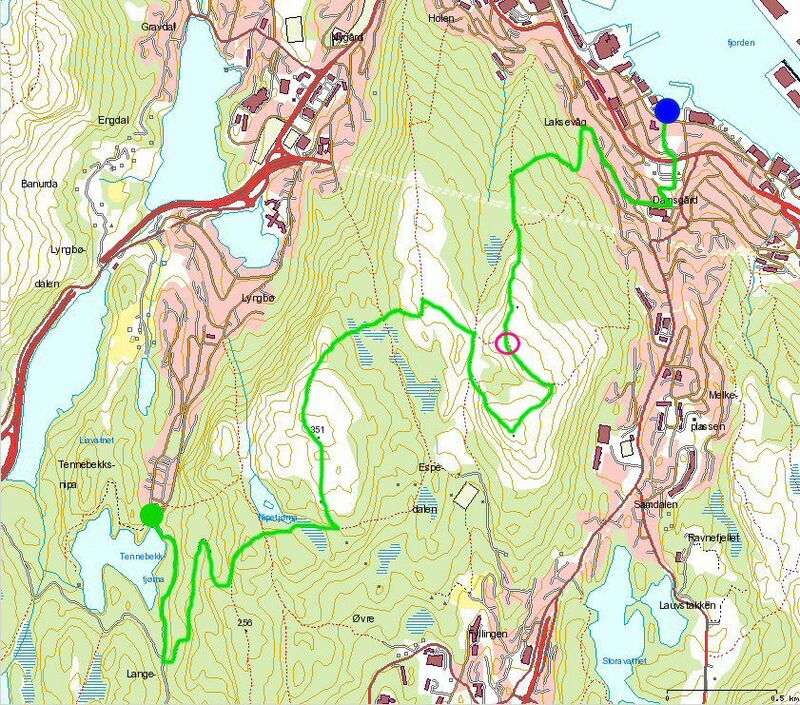 This was an A to A run with both the ON-OFF and ON-INN in Vetrlidsalmenningen. The trail up the mountain followed the road up to Skomakerdiket and paths from there to the summit. The trail back down followed paths to the road leading to Skredderdalen, and followed the path down Skedderdalen and along Fjellveien to the ON-INN. There was a shorter route down the mountain, but this would have been very treacherous in wet weather so the hares went for the safer but longer route. This was the longest trail to date and took approx. 5 hours to complete and set the standard for the following trails. This was an A to B run with the ON-OFF at Lægdene. 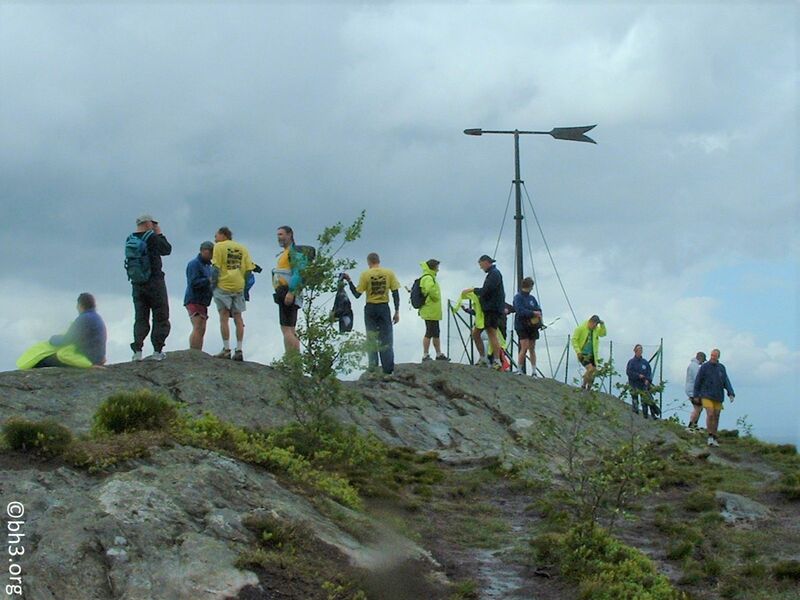 The trail followed one of the main paths up to the cable car station on Ulriken with a detour to the summit. The pack took the cable car back down to the ON-INN. This was probably an A to B run. The ascent was up the very step Stolzekleivene to Sandvikspilen. 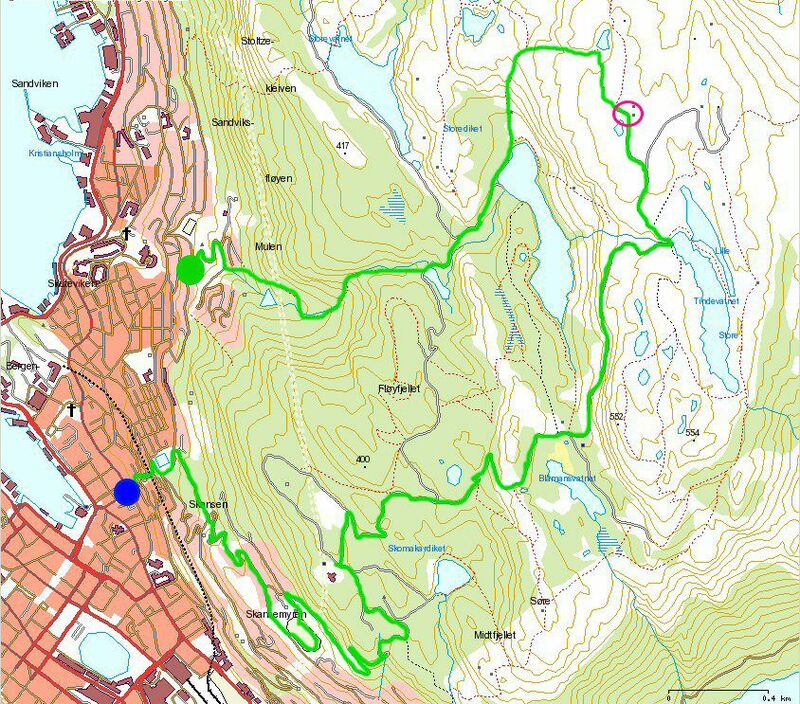 From there the trail mainly followed the roads to Fløyen and back to town. The summit was not reached and is approx. a 15 minute walk from the highest point of the trail. 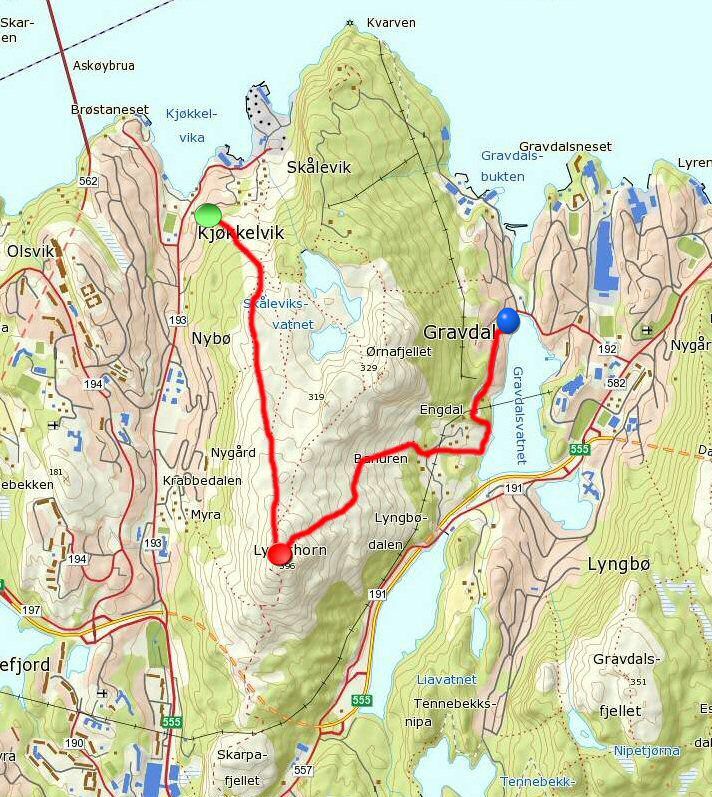 This was an A to A run with both the ON-OFF and ON-INN next to the World War II u-boat bunker on Laksevåg. The trail followed a ridge from Ytre Laksevåg to the highest point before heading back down another ridge to Vågedalen and back to ON IN. We sustained the most serious accident on this run to date, when Foxy slipped on the way down and fell off a cliff to a grassy meadow 4 to 5 metres below barely missing some large boulders. The summit was reached and is approx. 33 metres below the highest point on the mountain! This was an A to B run with the ON-OFF at Mulen. 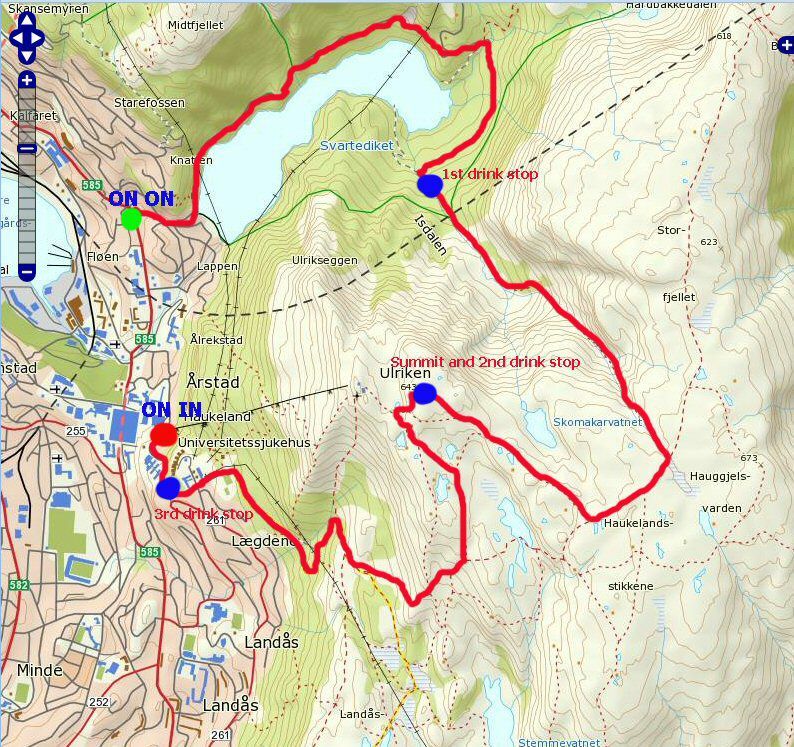 The trail lead up Skredderdalen, past the dam at Storevannet and up a valley to the highest point of the trail. The trail back to town followed the road past Fløyen to the ON-INN at Skansen. 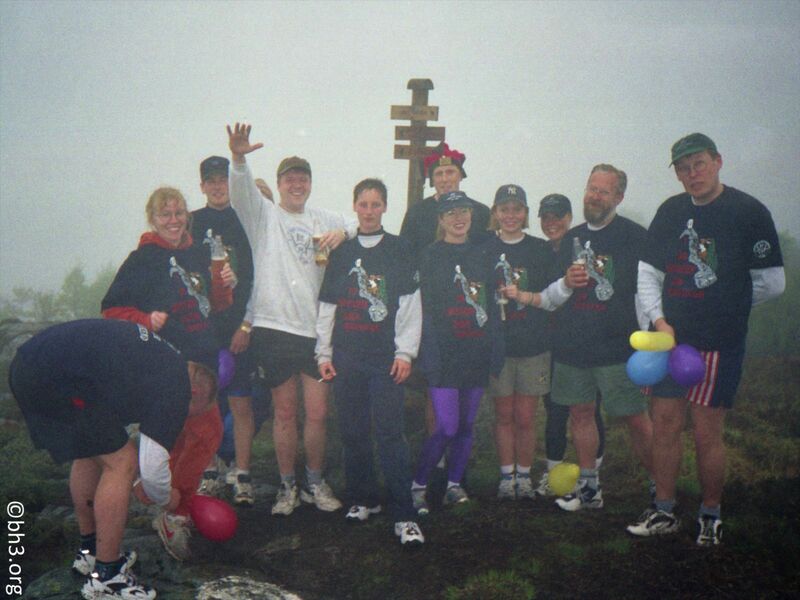 The summit was not reached but the highest point of the trail was only a short distance from the summit. This was an A to B run with the ON-OFF at NUTEC in Gravdal. 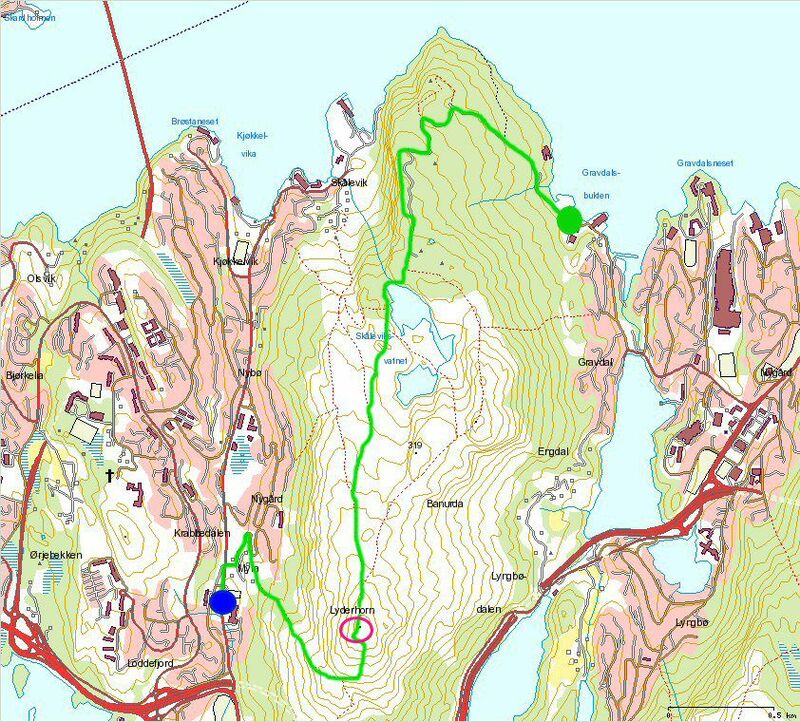 The trail followed paths through the old coastal fortress at Kvarven before heading for the summit via the main path. The descent down the mountain followed a very step path down to Olderdalen not far from Loddefjord. 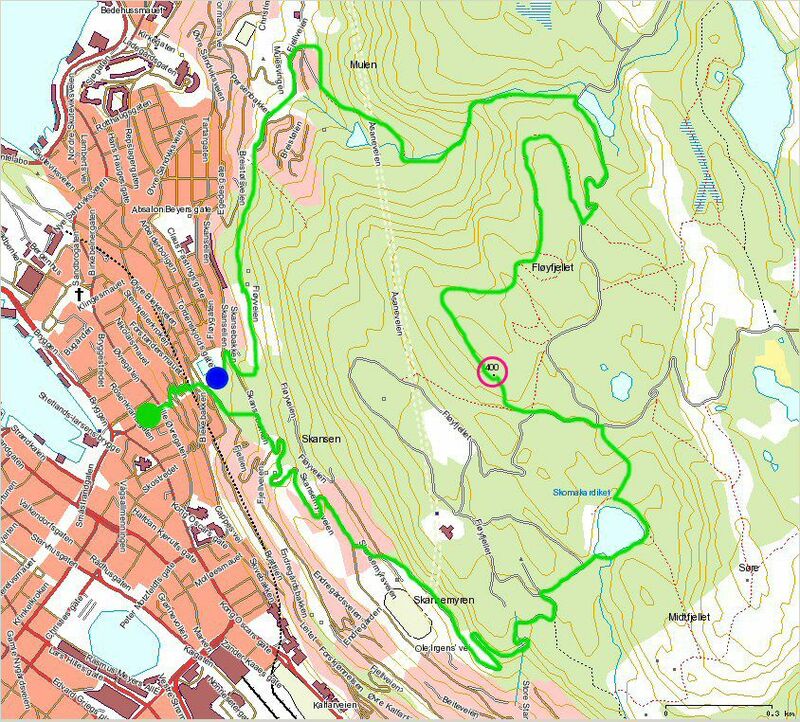 This was an A to B run with the ON-OFF at Krohnegården. The trail lead toward Ravnefjellet with the ON-INN at Melkeplassen. The summit was not reached and is approx. a 30 minute walk from the highest point of the trail. 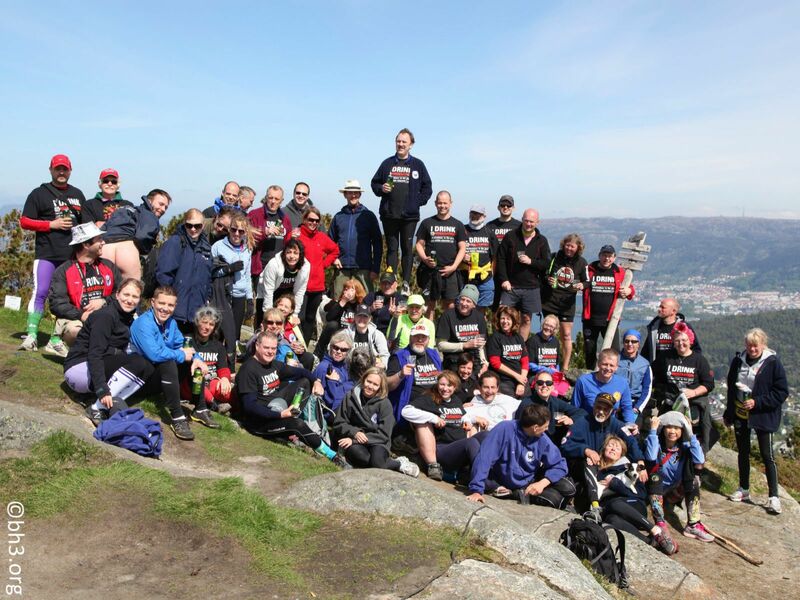 According to rumour, the pack took the funicular from the city centre to Fløyen and ran back down again. 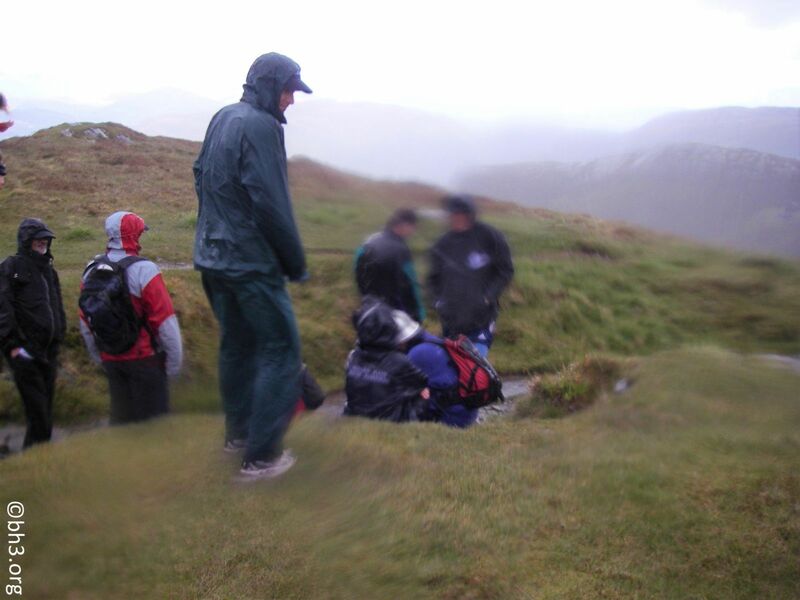 The summit at 400 metres was not reached and is approx. a 20 minute walk from Fløyen.